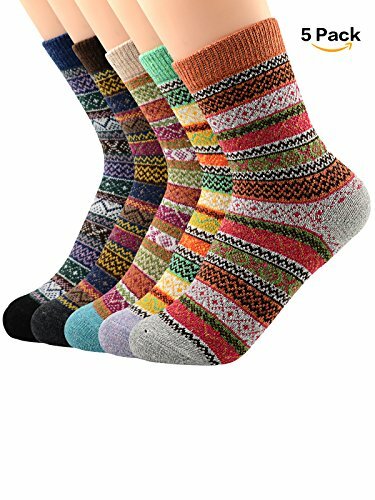 If you are looking for comfortable and fashion wool socks, these wool socks are very suitable for you. There are many pretty colors for you chosen. Just pick your favourite color. Special design various patterns, full of great fun and joy. Soft and comfortable cotton fabric on your feet, accompany you around every corner, go on a trip with you and living your colorful life. Nice and stretchy. They are high quality and softly warm up you feet in autumn and cold winter. They are great for gift-giving. They are handmade with complex process. Vintage and trendy design warm socks that will coordinate with whatever you're wearing. Comfortable, lightweight and versatile enough for any occasion. If you have any questions about this product by Century Star, contact us by completing and submitting the form below. If you are looking for a specif part number, please include it with your message.